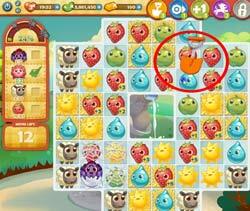 These Farm Heroes level 490 cheats and tips will help you beat level 490 of Farm Heroes. 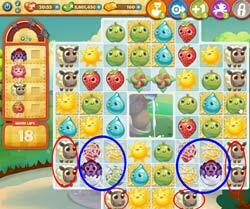 The objective of Farm Heroes level 490 is to collect 2 spiders, 2 flowers, 10 sheep and 85 strawberries in 17 moves. Level 490 Cheat #1: Its a trap! So the first thing that you should notice about this level is that six of the sheep are behind cropsies under webs, and very close to spiders. Never fear! There’s still a path for the sheep to get to the precious hay, but you have to act quicly or the spiders might end up trapping the sheep behind their webs. Try to make vertical matches next to the sheep on the bottom level and horizontal matches next to the other sheep to get them onto the hay. 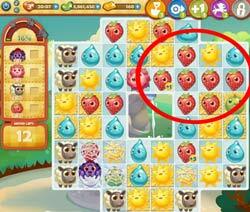 You have to collect 85 strawberries on this level. The only way you’re going to do that is by making special combos. Match five cropsies in a row to remove all of those cropsies from the board. Matching four cropsies in a row will increase the values of the adjacent cropsies. Basically, use every special combination that you can in this level to get the cropsies you need to meet your objective. If you get stuck with an important cropsy underneath a web, or on top of a bale of hay, or just generally in the way, use your trusy shovel to dig it up. The shovel can also help you collect the flowers. If you are running low on moves, use the shovel to help you make the flower bloom.